I heard this song yesterday at work and it took me back to when I would tell my mom I was asleep. In reality, I would be listening to the DC101 10 at 10 countdown on my Walkman in my bed. 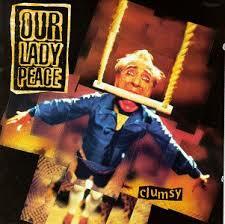 “Clumsy” by Our Lady Peace was on that countdown for a while. It’s still a song I enjoy to this day!